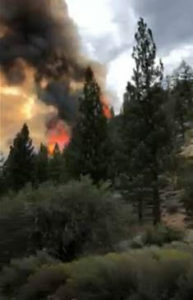 BRIDGEPORT — The California Department of Transportation (Caltrans) would like to inform the traveling public that US-395 has closed from the north end of the town of Bridgeport, to the south end of Coleville, and at the junction of US-395 and State Route 108 due to a wildfire. There is no estimated time of reopening. The closure has changed to a soft closure at the north end of Bridgeport to allow traffic to continue north to State Route 108, and State Route 108 eastbound traffic will be allowed southbound on US-395. There is still a hard closure for southbound traffic at Eastside Lane, south of Coleville. The traveling public is advised to avoid the area and use alternate routes.